Dawn-dusk asymmetries are ubiquitous features of the plasma environment of many of the planets in our solar system. They occur when a particular process or feature is more pronounced at one side of a planet than the other. For example, recent observations indicate that Earth's magnetopause is thicker at dawn than at dusk. Likewise, auroral breakups at Earth are more likely to occur in the pre-midnight than post-midnight sectors. Increasing availability of remotely sensed and in situ measurements of planetary ionospheres, magnetospheres and their interfaces to the solar wind have revealed significant and persistent dawn-dusk asymmetries. As yet there is no consensus regarding the source of many of these asymmetries, nor the physical mechanisms by which they are produced and maintained. 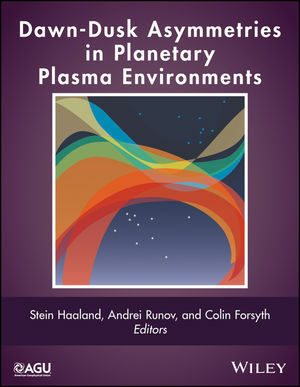 Covering both observational and theoretical aspects of dawn dusk asymmetries, Dawn­-Dusk Asymmetries in Planetary Plasma Environments will be a valuable resource for academic researchers in space physics, planetary science, astrophysics, physics, geophysics and earth science.